When I was a little girl, growing up in Austin, TX, my parents made it a point to drive my brother and me around to historical, or otherwise art related hot spots. One of the favorites was The Littlefield Fountain, or better known by my brother and me as The Water Horses. 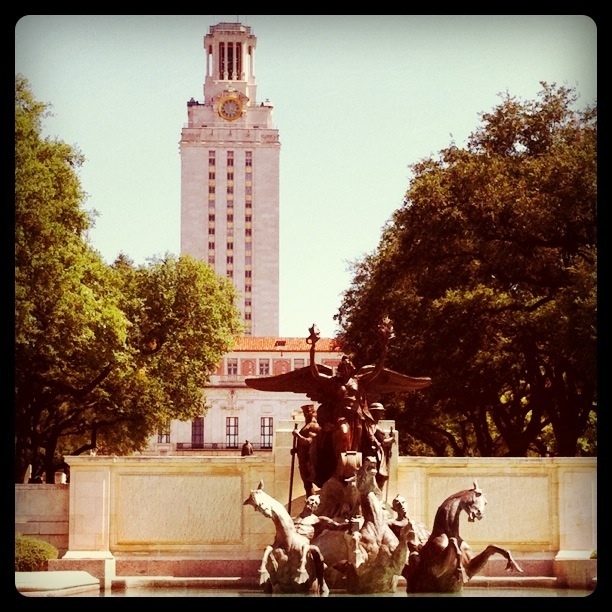 Built with a trust established by its namesake, Major George W. Littlefield, the fountain was erected as a memorial for University of Texas students and alumni who died during WWI. I remember always looking at the sculpture in awe; the horses so life-like. So badly I wanted to wade through the fountain, mount a horse and take off on a ride. I loved the water, fell in love with making wishes on my pennies tossed into the water with all other collected wishes being kept watch over by my trusty steeds. ← Why do YOU love Austin?